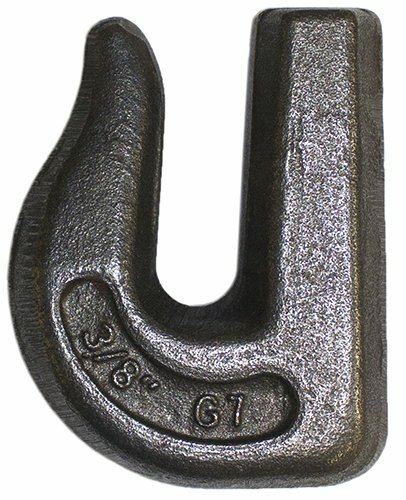 Hook, weld-on Type, hook style grab, working load limit 6600 lb., trade size 3/8 inch, grade 70, for use with 3/8 in chain. The Hi-Lift Jack Post-Popper Chain and Slip Hook accessory, in combination with the Hi-Lift Jack Post-Popper, allows efficient, cost effective, one person removal of almost any type of post; wood, concrete, metal, u-channel, etc. Use to remove posts made from wood, concrete, metal, u-channel, etc. 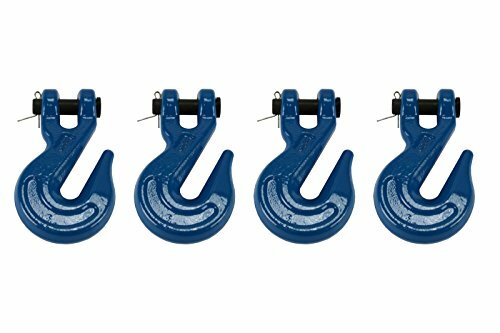 8ea 5/16" System7/Grade 70 transport grade clevis grab hooks. 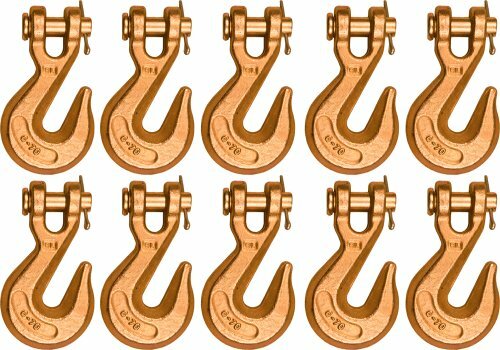 Drop forged, medium alloy steel hook, quenched and tempered then zinc plated. Use with System 7 transport chain. 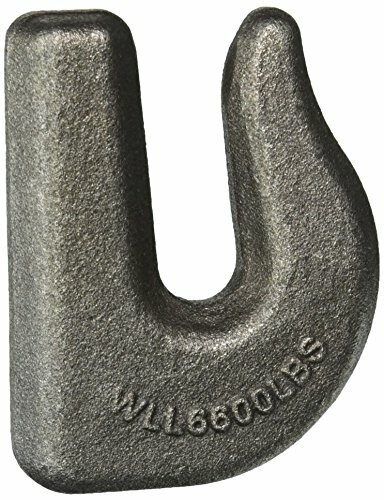 5,400 lb working load limit with design factor of 4:1 WARNING: Do not exceed WLL (working load limit) for any tiedown hook anchor point or device. This lot of hooks will be shipped from our Just Harris zip code of 97002 in one box to your confirmed address. 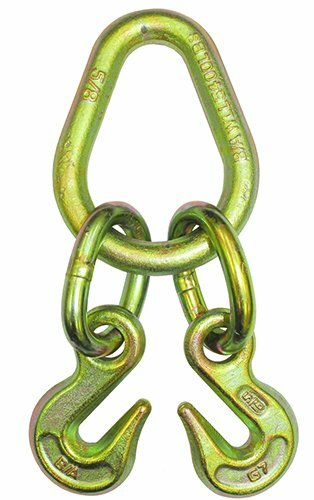 Chain Size: 3/8" / Clevis Pin Diameter: 0.45"
PROFESSIONAL GRADE EQUIPMENT - Professional operators choose Vulcan cargo control products to haul millions of loads every year. Vulcan is recognized as the most qualified, most experienced, tie down manufacturer in the world. Work with confidence, knowing that this 5/16" x 10' Grade 70 binder chain is backed by the 50 years of manufacturing expertise that only Vulcan can provide. 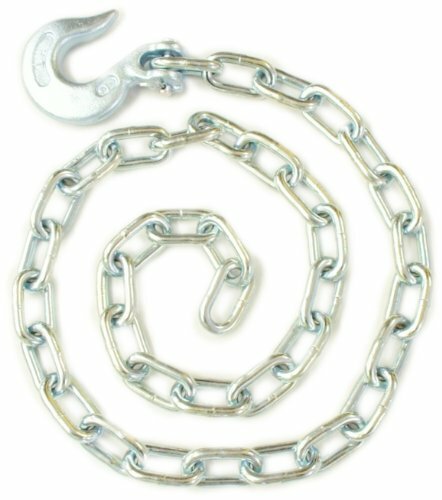 DESIGNED FOR SAFETY AND EASE OF USE - Grade 70 chains provide a higher safe working load than lower grade chains, but weigh the same. 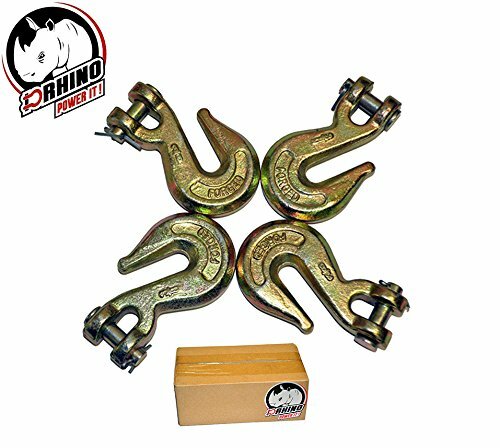 Rated and certified for transporting loads on flat beds as well as hauling vehicles, these chains are strong, durable, easy to tension and easy to store. 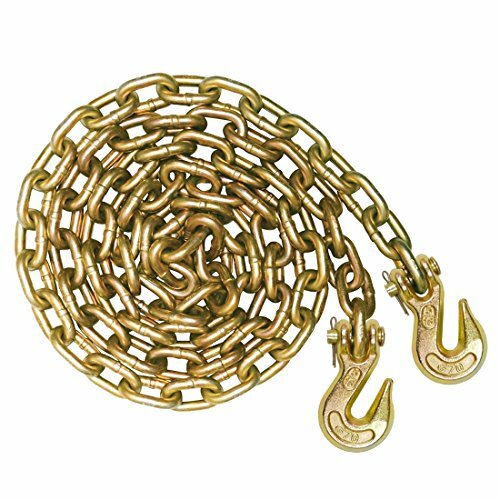 INDUSTRIAL STRENGTH CONSTRUCTION - The heat treated Grade 70 chain and hooks are intended to stand up to rigorous field use and harsh weather conditions. Zinc-dichromate plating provides corrosion resistance. The forged grab hooks feature a heat treated load pin with a retaining cotter pin so they stay attached to the ends of your chain, but can also be removed if needed. The throats of the grab hooks are universally sized to engage easily with 5/16 or 1/4 chain. PROPERLY RATED WITH YOUR SAFETY IN MIND - This chain has a 4,700 lbs. Safe Working Load and is intended for use with a load binder that has at least the same load rating. The rating is based on a 4:1 safety factor. 4:1 is the correct safety factor, recommended by the NACM, and our chains are always rated properly. BEWARE: some other suppliers on the market do not rate their chains at a full 4:1 safety factor, which is not safe and can be very misleading to the user. SAFE AND COMPLIANT - The safe working load of 4,700 lbs. corresponds with the embossed code on the chain links and the markings on both of the hooks. All Vulcan cargo control products meet or exceed all CVSA and DOT specifications, and comply with NACM recommendations. You will be compliant for any roadside inspection, and you can work with confidence using Vulcan products - a name you can trust. 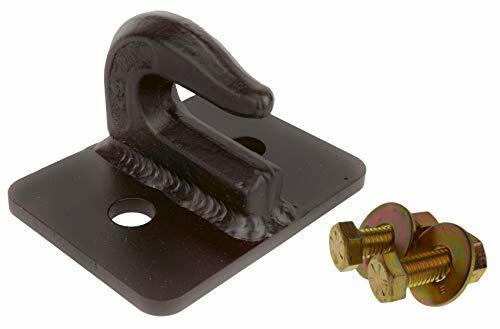 Buyers Products Forged Steel Grab Hooks secure tarps and other tie downs to safely transport cargo. From stake assemblies to ratchet straps, Buyers Products has all of your truck and trailer needs covered. 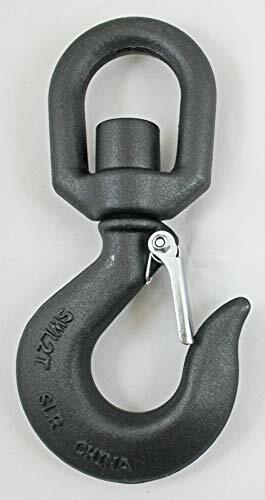 Indusco drop forged alloy steel swivel eye hook with latch. Intended for use as a positioning device and is not intended to rotate under load. A falling load may cause serious injury or death. Loads may disengage from hook if proper procedures are not followed. Hook must always support the load. The load must never be supported by the latch. Never apply more force than the hook's assigned working load limit (WLL) rating. Never lift with the tip of hook. 3 ton working load limit. Working load limit is based on a design factor of 4:1. Indusco drop forged carbon steel swivel eye hook with latch. Intended for use as a positioning device and is not intended to rotate under load. A falling load may cause serious injury or death. Loads may disengage from hook if proper procedures are not followed. Hook must always support the load. The load must never be supported by the latch. Never apply more force than the hook's assigned working load limit (WLL) rating. Never lift with the tip of hook. 3 ton working load limit. Working load limit is based on a design factor of 5:1. 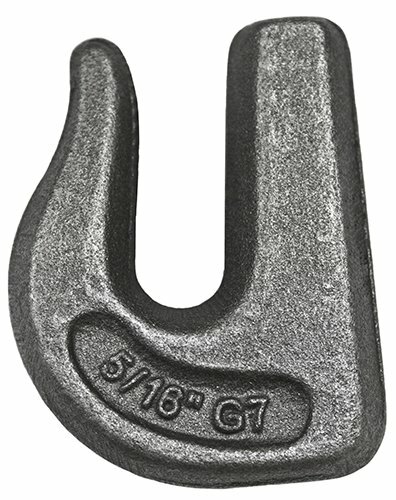 One pair of chain adjusters, 2 grade 70 grab hooks on pear link, WLL 5,400 lb., 60 angle. Manufactured in United States. 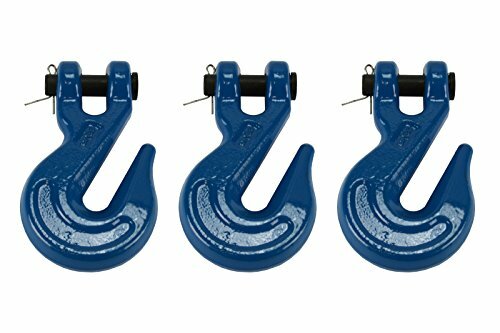 2 each 3/8" System7/Grade 70 Transport Clevis Grab Hooks. 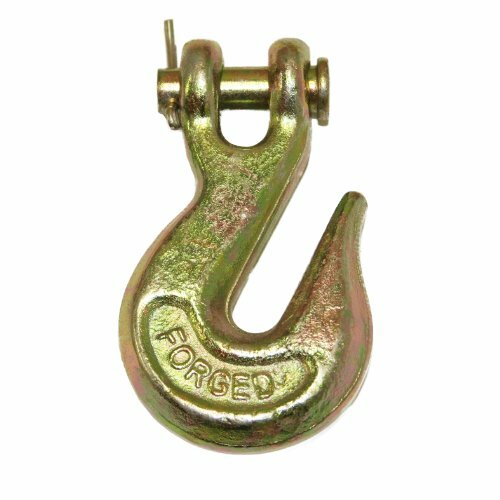 Drop forged, medium alloy steel hook, quenched and tempered then zinc plated. Use with System 7/Grade 70 transport chain. 30,000 LB Breaking Strength with 7,500 lb WLL (working load limit). 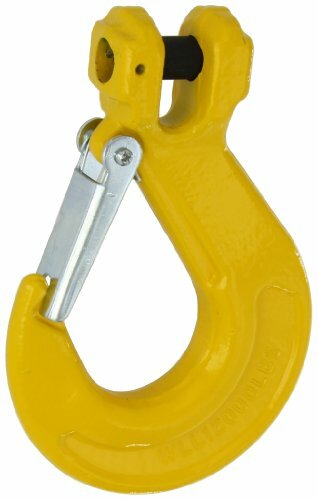 WARNING: Do not exceed WLL (working load limit) for any tiedown hook anchor point or device. This lot of hooks will be shipped from our Just Harris zip code of 97002 in one box to your confirmed address. Telescoping Skylight Pole with Hook Drive, 48" to 73"
Telescoping Skylight Pole with Hook Drive For Skylight and Awning Windows. Extended Length: 73". The Telescoping Skylight and Awning Pole is used for opening and closing retractable awning and skylight operators. The adjustable pole extends from 48 in. to 73 in., making it ideal to access those hard-to-reach areas. The open-hook design makes it easy to slip over the operator crank. Telescoping Hand with a Hook. 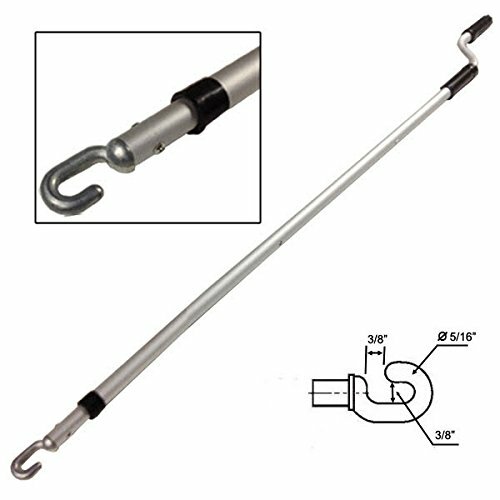 Telescoping Pole Extends from 4 to 6 ft.
Weld-on Type, Grab, Hook. Working load limit 4700 lb.. Size 5/16 inch, Grade 70, for use with 5/16 in chain. Working Load Limit 4,700 lb.